Small Worlds features a survey of glass paperweights from the 19th century to present day. The exhibition highlights different techniques, styles, and various types of paperweights. The 19th century was the classic period for paperweight manufacture. This exhibition features works from European glass factories, including the French crystal manufactures Baccarat, Clichy, and St. Louis. Paperweight production all but ceased in Europe by the late 19th century but was revived in the mid-20th century in both Europe and America. Independent artists experimented with new designs, techniques, and materials. 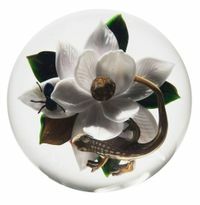 Paperweights continue to be a popular object of art today, and manufacturers and artists all over the world have enlarged the scope, scale, design and fabrication of this diminutive object.